Two years ago I’d never have thought of making baked doughnuts, the treat we Britons are led to believe provides the sole source of nourishment for every police officer in North America. However, the effect of a couple of individuals upon my gastronomic sensibilities has been catastrophic to the point at which I now find myself, unable to tell right from wrong. All is not lost – you may have invaded my kitchen, Yanks, but I shall never let you sully my grammatical skills. To be honest, my intention to make doughnuts, not donuts, had been made clear before these came along. Katherine, cottoned on to this pretty quickly, and bought me a doughnut pan for my birthday. It works perfectly – this was my first ever attempt! In fact, I’m so impressed, despite initial scepticism, that one might find another batch appearing not to far down the line. As you can see, the recipe was kept very simple (me being rather virginal in the doughnut department), but the cinnamon dip was wonderful and not at all overpowering. On a side note; do you like my new milk glasses? They are made out of 100% recycled glass and cost me a mere £5! They are so cool – the bargain of the century perhaps? I think I’m about to go props galore – I also received an awesome food photography book and the photos and all that they contain are making me mighty jealous. There is something really rather pleasing about searching out and buying new crockery, etc… anyway, this post has been rather short, sweet and self-indulgent – you have my apologies – so please enjoy my first ever doughnuts. 1. Preheat the oven to 220C. Mix together the flour, 80g of sugar, baking powder, nutmeg and salt. In a separate bowl beat the eggs and stir in the buttermilk and 2 tbsp of melted butter. Add the wet to the dry and whisk until smooth. Grease the doughnut pan and fill each ring until almost full. 2. Bake the batter for 6-10 minutes, until the doughnuts spring back when pressed. Leave to cool for a few minutes before turning out. Dip each doughnut in turn in the remaining melted butter, followed by the remaining sugar mixed with the cinnamon – ensure a nice even coating. Serve as quickly as possible. Cost: When one considers the ingredients used to make doughnuts one soon realises just what a rip-off they are if shop-bought. Indeed, this batch set me back a mere £1.20 – we sell a single doughnut in work for £1.10. That’s quite a ridiculous mark-up really. oh Buttermilk doughnuts, baked not deep-fried. For a second there I thought maybe Frugal had abandoned completely his health kick! Clearly, not entirely! I’ll wait until your next doughnut installment to be tempted further and then I may succumb (to the inevitable) and get one of those nifty pans. These look quite the treat. Yes! I do hate to deep fry. Oh no, never! I’ve done SO much exercise this week, Spree. You will succumb, I promise. I shall make the post sooner rather than later. You have a donut pan! luckky you! And I am a prop hoarder as well- I would rather spend on props than on clothes. I wish I had a closet big enough to accommodate this hoarding passion of mine! I am lucky :). I like clothes too though :P. I get cheap props second hand usually too :D.
Wow – am very impressed with these. Now I want a doughnut pan! Thanks! Yes! They work surprisingly well. Cool glasses indeed. 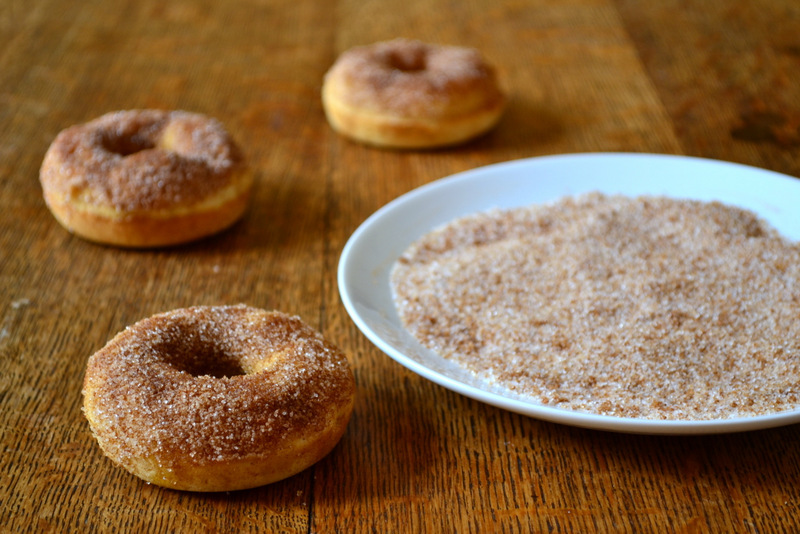 Doughnuts look great, but I have never been a fan of the American obsession with cinnamon. Apart, that is, from the childhood treat of cinnamon toast, which as the name suggests was toast with cinnamon and sugar sprinkled onto it, lightly grilled. I was relieved to see that your doughnut pan was just a pan, and not an electric doughnut maker :). I want to pick one off the screen and eat it in one mouthful! Nom nom. Love the glasses, the doughnut pan and the doughnuts! Looks yummy! We do, Daisy – we do. They looks evilicious! I wish I was a NAmerican cop now! 😉 And the milk glasses do look lovely! Ooooh, I love this! I love donuts (heh)! I also really like your glasses. Great find! Oi! :D. Thanks! They are awesome. Haha, thanks! Tasted so good. ldhankey: I didn’t know we Americans were obsessed with cinnamon! This knowledge makes me wary of traveling to other places less inclined to partake of the cinnamon. 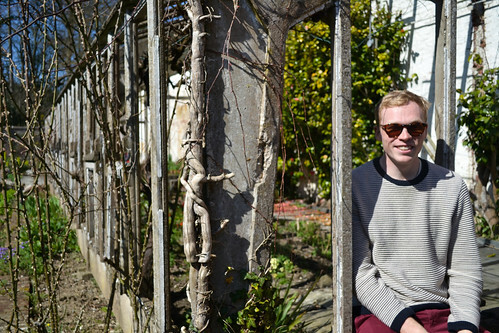 FF: I am insanely jealous of those glasses, I’ve been on the hunt for the very same thing. The only ones I have found so far are at Starbucks and I just refuse to have glasses stamped with “STarbucks” in my cupboard. I didn’t know that either.. Haha – You’ll find them eventually :D. Don’t get those… I hate Starbucks. Oh, and I’m pretty sure the policemen are eating fried doughnuts. And just to be clear, according to American Southern Tradition, they should be served with a side of fried chicken. Chicken & Doughnuts, it’s a real thing, I swear. Chicken and donuts is a little weird. I’d much rather have chicken and waffles! Chicken and waffles. The doughnut stands alone. Doughnuts vs. waffles: I must admit I have seen both and have tasted neither. Do you wrap the chicken with the waffle like a Pig in a Blanket or just serve the chicken on top? Definitely not CA Cuisine. Really? You’ve never had either? Amazing! You serve the chicken on top. It is delicious. Come to the South, and you will find the dish anywhere along with several other weird combinations. I am making fried tomatoes for supper, as a matter of fact! I’m British – that literally doesn’t exist here… friend tomatoes sounds like the antithesis of anything I’d ever eat. They are supposed to be nice and fresh and are perfectly nice eaten like an apple. I’ve never really understood southern cuisine… but I don’t hate it… I appreciate it is a tradition. Frugal, great job! Better looking than any doughnut in LA! oh wow and here i thought doughnuts were deep fried. And I’ve been trained to think that £1.20 was cheap for a doughnut! They are usually, but I hate deep frying. I always think that baking is the better option that quite often yields better results. £1.20 for a cake is never “cheap”, though depending on where you are it might be reasonable. These look really great. I am not a huge doughnut fan since I find them oily. However these sound great since they are baked. Thanks for sharing the recipe…I can’t wait to try it! Thanks! These aare not oily at all, you’ll be glad to hear! I hope you love them as much as I did. Baked doughnuts? Oh that’s much healthier! They look great too! It is indeed and they taste just as good (in my opinion). Thanks, Celia. Doughnut pan for your birthday? That girl’s a keeper! 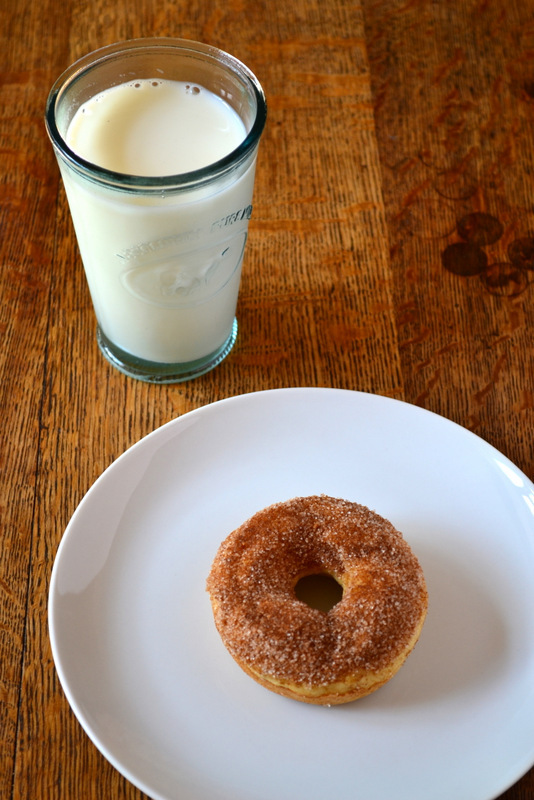 I think my beloved would flip if I made these – man loves a good cinnamon doughnut! These look awesome! Love the milk glasses!!! The doughnuts are great as well. Thanks, Daisy! One of my favourite ever purchases. As I recall, your cast iron pan was quite a steal! The glasses were definitely a great buy! You do know that traditional donuts/doughnuts are deep fried, right? 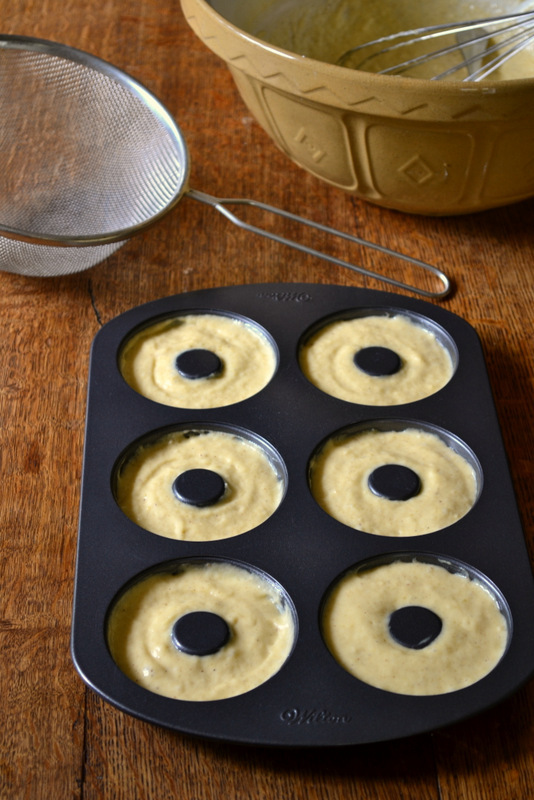 I’ve seen some donut pans floating around the blogosphere and have been intrigued by them. I’ve been wondering if baked donuts are up to snuff! They certainly look fab, though. They really were :). I do indeed, but these work just as well. I was sceptical, but they worked absolutely perfectly. Haha, thanks… I think I do :D. Yes! Get one. You make me want doughnuts! 🙂 Looks delicious, as always! I do like the milk glass! Thanks! you do, they work SO well. i hope no one just saw me try to lick the computer screen…i can even smell them….wait, that’d be my cinnamon cookies in the oven (aussie who is obsessed with cinnamon, not american). I am so on a doughnut mission now, screw the cookies. and yes, your glasses are excellent. good job. Keep that to yourself… that’s weird… Thanks! I totally expect to see some doughnuts. Mmmmm. That’s what every cop in America just said. Because these looks great. And they’re jealous of your new milk glass. Okay, maybe that’s just me. Great stuff! OH, how I miss doughnuts..now that I don’t live in the States! Mt favorites are the munchkins (doughnut holes)..the chocolate ones. mm-mmm!! DONUTS!!!! Nick succumbed to the *donuts* craze! I couldn’t be any happier to see donuts on the Frugs’ site. You are no longer a donut virgin. Donuts. Have I said donuts enough??! Nope. DONUTS! P.S. Did you call me a Yank??? Haha! I did! I shall make some more soon too :D. Yes, I called you a Yank… of course I did. These look amazing! I’d love to buy my own doughnut pan, but I can’t justify the single-use (or kitchen space it would take up, ha). I bet these would be just as great as doughnut holes though! Just use it LOADS of times :D. It’s a great purchase – though I perhaps wouldn’t have bought one for myself… though it is an AMAZING present. I’ve seen a few of these baking trays around. Looks like it delivered a perfect batch too. You should totally buy one, Noodle. 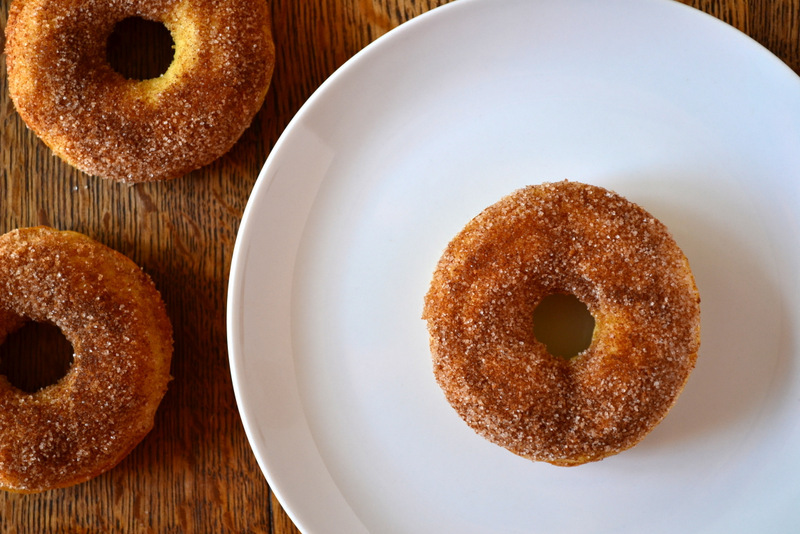 They make doughnut baking SO simple. Yay! Saw you on Tastespotting! And congratulations on your first doughnuts! And your birthday, and those adorable milk glasses, and the photography book… and everything. I’ve never made doughnuts before, and you make it sound so easy. I adore cinnamon, too, so these sound just perfect! Haha, you can indeed :D. Thanks, Willow. They actually were surprisingly easy! Ooh, can’t wait to try these! I bought a doughnut pan about 3 months ago that I have yet to use…and I love the fact that these are baked and not fried. Love those glasses too! LOL! Yanks. Glad I’m a rebel instead. Although biscuits are just as bad. I think everyone has their favorite doughnut – raised gazed is mine – which supplies enough of a full blown fat and sugar rush you only need 1 in a lifetime.
. . . umm maybe that’s why American cops are like they are. . .
😉 We should talk abut other things! Nice milk glasses by the way. Haha, indeed! I adore them! My current favourite thing I think. I made these this morning – yum! – and wrote about them for today’s post! Yes, I saw – they looked cracking! Your entire commentary makes me laugh!! Despite our reputation, I haven’t had a doughnut in years and definitely have never attempted to make one, though I find all the homemade versions look so delicious, including yours!! I did eat a significant amount of doughnuts growing up though, as my grandparents would bring a big box every time they came to visit! I’m finding that I’m not alone in that tradition either! I’m so glad – it’s what I aim for :D. You’re clearly one of the good ones haha. I’ve only very rarely eaten doughnuts… they’ve never appealed, but these were gorgeous. I’m a sucker for new kitchen stuff! It’s my weakness…I may have to get one of these pans. It is hard to justify frying doughnuts, but baking them seems a little less naughty! 😉 Thanks for sharing! Hehe, I love kitchen stuff too. You should get one – so worth it! Haha, thanks! such cool glasses. I am cherished haha, and my birthday was so fun. I’ve always enjoyed your mastery of grammar. 🙂 I also liked the simple appeal of your first photo. Your new glass added to the appeal. Good eye — for doughnuts and props! These look great, however I would prefer a flan. Thanks! Isn’t a flan totally different? Tut indeed, donut it is not! You’d better make one then, Smidge! Haha – don’t let them loom too long. Thanks! Yes, I think so.